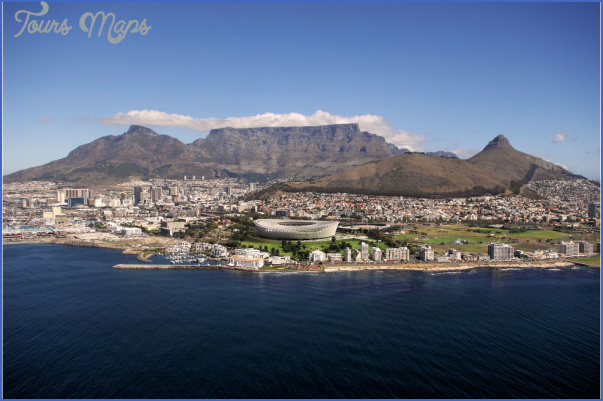 The richest of the African nations, South Africa also has one of the most attractive climates and an abundance of natural attractions. Generally moderate, the climate provides sunny days and cool nights. 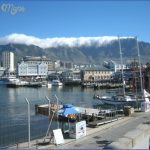 The average mean temperature is remarkably uniform, the most southerly point having a mean average temperature of about sixty-two degrees while Johannesburg, one thousand miles north, has a mean temperature only one degree lower. The reason: Johannesburg sits on a fifty-seven-hundred-foot plateau. The interior plateau ranges from three thousand to six thousand feet above sea level. A twenty-seven-hundred-mile coastline has some excellent swimming and surfing beaches. Visitors to the country exclaim over the abundance of natural beauty, the land itself, the coastlines, the range of flowers, birds, and wild animals. The United Kingdom is the source of most visitors; the United States is in a distant second place, followed by Germany and France. Tourism brings in about $600 million a year. The South African Tourism Board has one of the largest national tourist office budgets, close to $20 million a year. Johannesburg is the business center of the country with a population of 1.4 million. 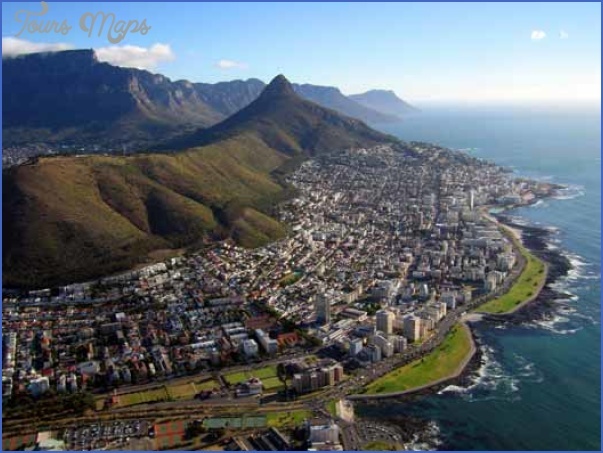 Cape Town, in the south, is slightly smaller, 1.1 million. 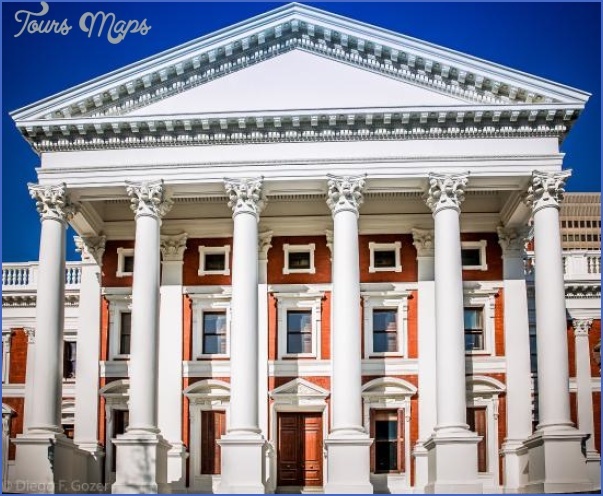 The country maintains three capitals: Pretoria for administration, Cape Town for legislation and Bloemfontein for judicial functions. Durban, on the Indian Ocean, is the most popular vacation destination. South Africa has the most and probably the best of wildlife parks. They come under different names. The really big ones, the National Parks, are run by the government. The provinces operate their own game reserves and there are also nature sanctuaries run by local authorities or organizations. There is a variety of private game parks, shooting ranches and wildlife farms. 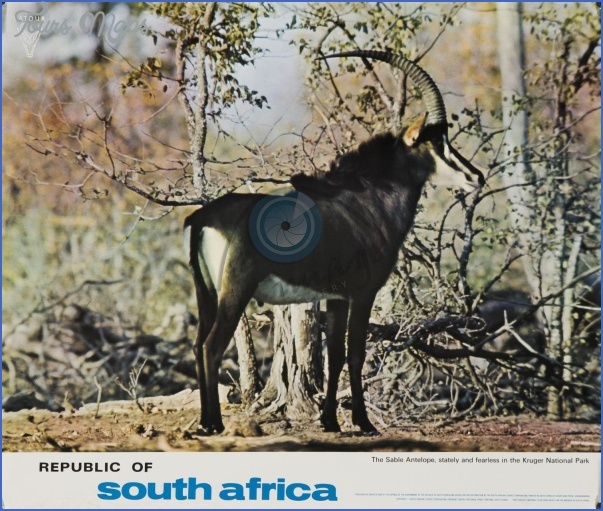 Kruger Park is the biggest, best and best known. Land for the park was set aside in 1898 by the great Boer leader, Paul Kruger. It lies in rather flat, bushveld country against the border with Mozambique. Comfortable rondavels, adaptations of the traditional African beehive hut, with hot and cold water, are available for the visitor en route from Johannesburg. There is even freshly cut well-dried firewood stacked for the traveler’s convenience. Adjoining Kruger Park is the Sabie-Sand Game Reserve (150,000) acres), one of many such private reserves. Namibia, formerly Southwest Africa, is a ward of South Africa, funded and controlled by South Africa. Wildlife enthusiasts revel in Namibia’s Etosha National Park. Described as the world’s largest corral, it covers 8,598 square miles and stretches 175 miles from east to west. Some eighty thousand mammals, including five hundred lions and twenty-five hundred elephants, live there under natural conditions. The Park is like a mammoth zoo in that there are five hundred miles of fences and the animal population is controlled. If, for example, zebra multiply excessively, they are sold to South African farmers, who then sell hunters the right to stalk and shoot the animals. About fifty thousand tourists visit Etosha each year. Because of the soil and climate conditions the lions and elephants are thought to be the largest in Africa. The lions are certainly big, big enough to have eaten a few tourists who were foolish enough to leave their vehicles. 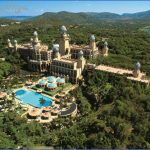 Sun City, a Las Vegas-like enclave in Bophuthatswana, is about two hours by car from Johannesburg, a place where color prejudice disappears in the bedroom, with casino gambling and Vegas-like entertainment. In the whole of Black Africa the country of South Africa is an oasis of order and prosperity. 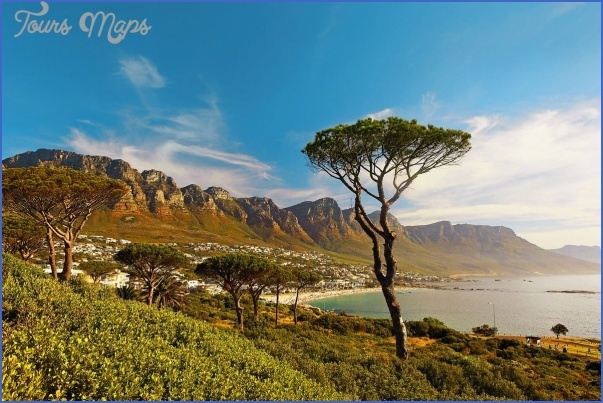 The nation of South Africa is the most varied, lovely and safe in which to travel. It is also one of the most anomalous. 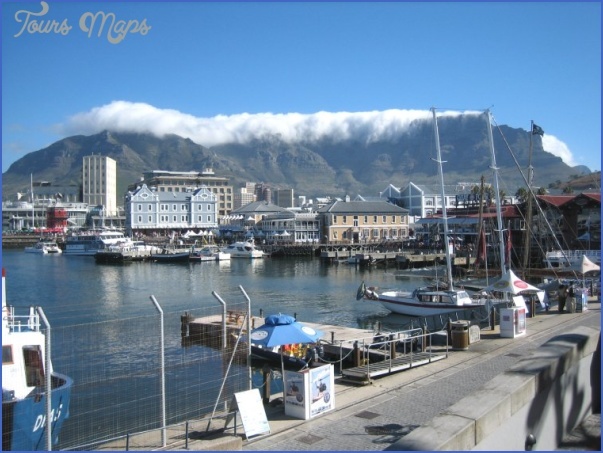 Wrote Sir Francis Drake after rounding the Cape of Good Hope in 1580, This Cape is the most stately thing and the fairest Cape we saw in the whole circumference of the earth. Blacks constitute 67 percent of the 28.5 million people. 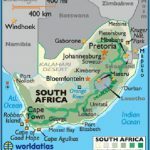 It is the only industrialized country in Africa, the world’s richest in terms of white per capita, non-petroleum wealth. Fewer than 4.5 million whites control a country with twenty million blacks, three million coloureds and one million Asians. Only one Black African nation, Malawi, has diplomatic relations with South Africa. Many African nations will not put through phone calls to South Africa. Virtually no Black African nation admits to doing business with South Africa. Even so, many do. South Africa has superior air service but the flight times from the United States total about seventeen hours. Almost every country in Africa denies South Africa landing rights. Long-haul flights from Houston, New York City, and London must stop to refuel on the island of Ilha do Sal, one of the Cape Verde Islands off the west coast of Africa. The islands, a sovereign nation, have only the skimpiest of travel facilities. South Africa’s Blue Trains, running between Pretoria and Cape Town, are said to be the ne plus ultra of train travel. Others are not sure. The train travels about 50 mph, on an average a bit slow good, say the enthusiasts, for viewing the scenery. The trains are all compartments and all but the least expensive come with their own toilets or toilets plus showers. The most expensive compartment includes a tub and its own liquor cabinet. Full, the trains carry only 106 passengers. Even before the train departs, white-jacketed stewarts deliver sparkling wine to the passengers. Food aboard the train is the same as is served in the parliament building in Cape Town. A British breakfast with kippers, or poached fish, broiled tomatoes or chicken livers starts the day. Seven-course lunches and dinners are elegantly served and there are excellent South African wines. Meals are included as part of the fare. Passengers can ring at any time for snacks and drinks to be served in their compartments. The trip takes a little over twenty-four hours versus two hours by air. South Africans view the Blue Trains somewhat as the French once looked upon the S. S. France, a symbol of national prestige. The S.S. France is now the S.S. Norway and cruises in the Caribbean Region. Let’s hope the Blue Trains continue to offer rail elegance. 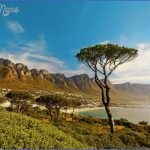 Two reasons stand out why relatively few North Americans visit South Africa: distance and its corollary, cost. Another reason relates to insecurity derived from the kind of image of South Africa projected by the news media. The nation, with whites as a minority, is controlled by the whites through the use of considerable repression. Present policy is to move toward granting some political power to the coloureds and Indians, but not to the blacks. 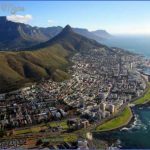 With this political arrangement many would-be visitors to South Africa are simply afraid to go there. 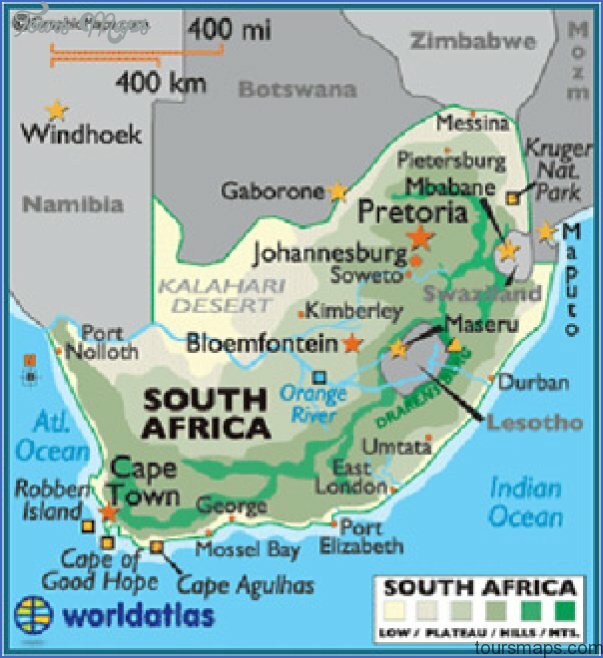 This policy of Apartheid, meaning apartness or separateness, a system that segregates whites from blacks, Indians and coloureds, also keeps a distance between South Africa and the rest of the world. As part of the apartheid policy homelands were set aside by the government, each a state for a particular tribe. Each is supposed to be independent; each has a president, a parliament and some political autonomy. As of 1982 there were four such states: Transkei, Bophuthatswana, Venda, and Askai. 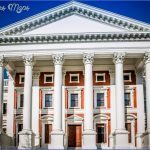 Because of their dependence upon South Africa, no government other than South Africa extends them diplomatic recognition. South Africa has immense mineral wealth. It has only 6 percent of the total population of Africa while its production output is equal to one-quarter of that of the whole continent. It is the world’s largest producer of gold each year and a large producer of diamonds. The country is the world’s largest producer of platinum and electrolytic copper, ferro-chrome and ferro-manganese. There are antimony, chrome, lithium, manganese, uranium, nickel, and vanadium. Coal is also abundant. 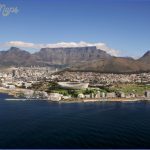 The South African National Tourist Board is very active and the national airline has reduced round-trip fares from Houston and New York to Johannesburg. The Tourist Board is also active in the Durban Hotel School. 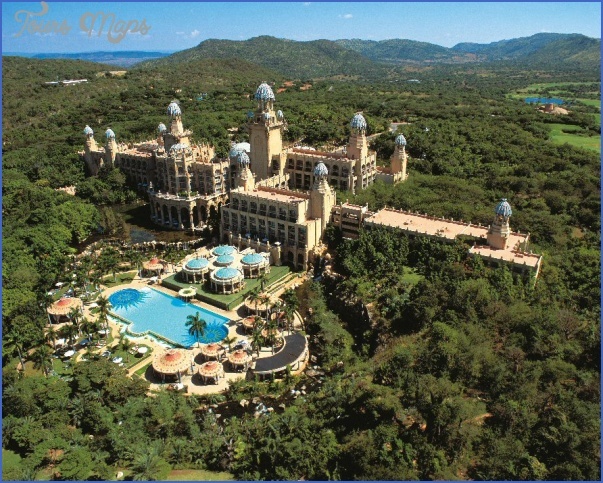 The Board is in charge of rating South African hotels. The ratings range from one to five stars; fifteen hotels hold the coveted five-star rank. More Americans are likely to visit the country once it becomes better known and as visitors report back on their experiences. Is there a distinctive South African cuisine? The Afrikaner kitchen comes closest to being original, a combination of Dutch, German and native foods and cooking skills. Boerewors, a well-spiced sausage in six-foot lengths cooked on the hot wood coals of a campfire, along with cornmeal mush cooked very firm and almost dry, is said to be an experience. The melktert (milk tart) is said to be enjoyed even by those who neither like milk nor tarts. Among the array of seafood dishes, pickled fish is a favorite. The fish is curried in a piquant sauce with onion rings. If it is really good the eater perspires copiously and perhaps screams a little. Smoked snoek is similar to smoked salmon, but cheaper. South Africans are outdoors people and favor the barbecue with plenty of meat. South Africans are delighted to have guests. If you are a keen meateater, you will be delighted too. As one writer puts it If you are a vegetarian, you had better hide in a darkened room with a handful of nuts. 1. The Africans, David Lamb, Random House, N.Y. 1982. 2. Los Angeles Times, May 16, 1982. 4. David Lamb, op. cit. 5. 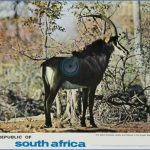 South Africa, Dennis Kiley, B.T. Batsford Ltd. London, 1976.